My budgie likes to play "the sliding game" recently...he climbs up to the top of the cage, grabs on with his feet and slides down. Repeatedly. I wish he would learn to say "Wheee!" when he does it! I call my new kitty Houdini cause she runs outside everytime I open the door! I like to lay on my bed while wasting hours on my laptop, she sits on my back and licks my hair! Our cat Cosmo and our 9 month old daughter are best buds, he comes running if she cries and lets her chew on his ears and pull his fur and tail, all while purring like crazy. Our older cat Mojo knows better and he runs away. Sean's rat Creeper had quite a few antics. He got his name (before I met him his name was Zero) because he would always stare at me, especially when I was scantily clad. He would also drink REALLY loudly as soon as we wanted to go to bed. The other rat would drink super quietly, almost like he knew he was bothering us. My favorite thing he did was when he would be out on the bed with me for snuggles and play time and I would have popcorn or some cereal. I'd give him a little piece to share, and then he would come back and help himself out of the bowl. It was adorable :)>>> He went to a new home since the new house doesn't allow pet. I miss him. And he was fat; once he had his head out of the hammock and it made his neck fur scrunch around his head so he looked extra fat (see picture). 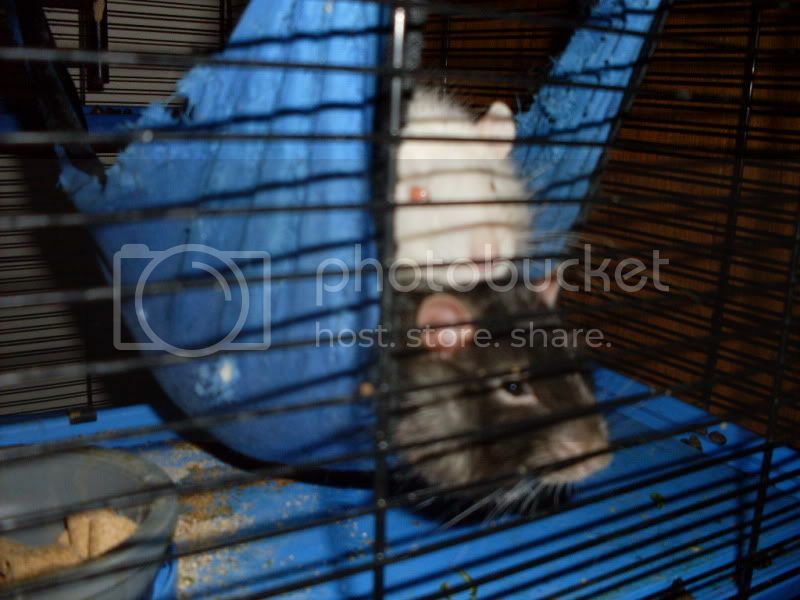 Nearl, the other rat who is now deceased :'( ,always used to put his head over the side of the hammock and it would look like he was smiling. So so so cute. 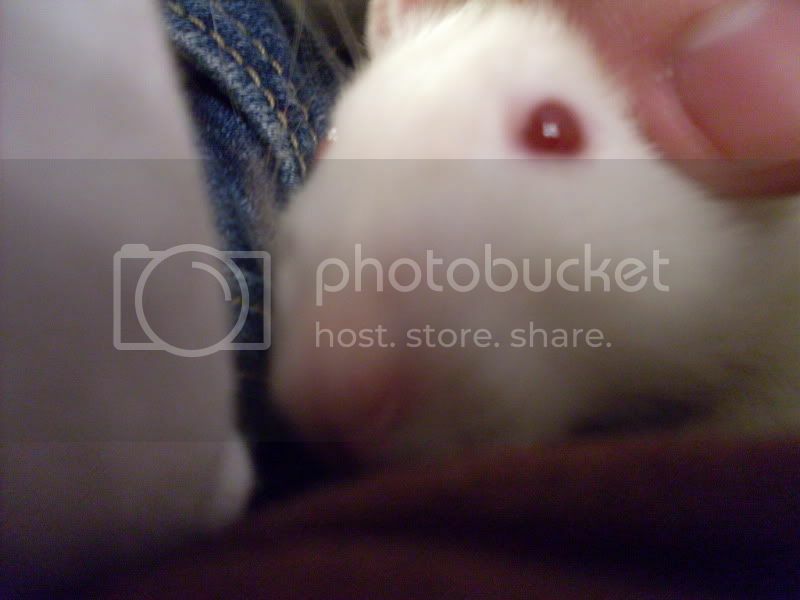 Last pic is Nearl looking cutesy. He was my bestest friend. Aawww! Nearl was a PEW! 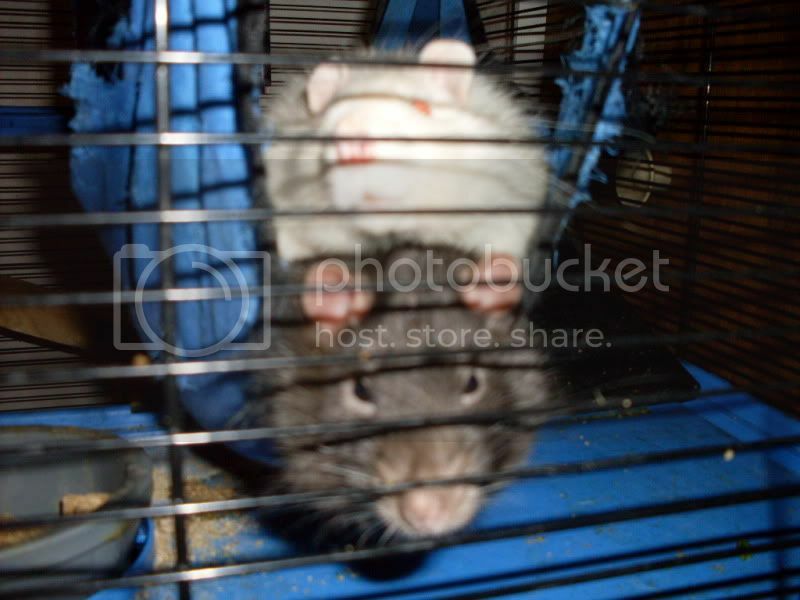 Now while rat grooming is nothing unusual, my Brandy is just hilarious when she does it.... First, she's always been aggressive with it; I always knew when they were wrestling/grooming because Pip would constantly 'Eep! when she was the victim... ::) hehe. But Brandy has a variety of grooming techniques, I've learned. Mostly she grooms my lips, nose, and fingers by biting/nibbling lightly with plenty of licking. But when she gets really excited, she uses her little hands to try to dig in and open my mouth, and she succeeds if I'm not careful. Her "love bites" get pretty painful at those times, too, so I have to remind her of that by squeaking loudly and saying "NO!" Lately I've been trying to train her to give "nice kisses" by using one of her favourite treats as a reward.... I'll rub some of the "essence" of the treat (like a grape or tiny bit of chocolate chip) onto my lips, say "Give mama kisses!" and let her lick it off. She's good about not biting in those cases, so she gets praise, pettin's, and the treat as a reward. She's getting better at doing it without the treat nowadays. The only thing I can think of is almost everytime we walk into the kitchen, the guinea pigs think we are going to get them treats and they start wheeking for treats, running around the cage, and some (mainly Babs) almost climbing out of the cage in excitement. My guinea pigs would wheek when they'd hear plastic grocery bags rustle (because produce comes in plastic bags). It was so cute. if i'm sitting at the computer, she jumps up onto my lap and proceeds to climb up onto chest (again) to sleep. she's doing it right now, and has been that way for about an hour. it's really hard to type :winktongue: I also just found out that she likes to play fetch! She's 15 and has only recently started doing this over the past few months. It's not her normal behavior (even though it is quite funny, I've caught her doing it a few times) and I hope it's not the onset of feline dementia. She and my roommate's cat Meatball have also 'hung out' through the cage so far. Both of them are pretty laid back so Meatball usually lays beside the cage purring and Scampi ignores him or sticks her nose out to sniff him. Yesterday Scampi was eating a piece of hay and Meatball was tentatively pawing at it, like "wtf ARE you?". It was adorable. Our kitten Toby tries to nurse on our Boxer's mouth! I made a video, but it kind of blurs a bit in parts (I didn't know about the auto-focus) so don't mind the quality! haha I know it's kind of gross, but I still think it's cute! I was just petting my cat Charlie, and said "I love you Seeley." He gave me a death glare. Seeley likes to groom. Himself, the other two cats, and the dog. Sometimes me. The other night he groomed himself and then Ralph, then he used Ralph as a pillow. It was too cute.